Baby Digger is in the monkey see monkey do stage! It’s adorable, she loves to do anything Mommy and Daddy are doing! If I wipe the table she pretends to wipe the table, if you turn on the light she wants to flip the light switch and so on and so on. It’s really fun to watch her learn all the new things just from watching us. We received the new Little Tikes Cupcake Kitchen for review and I was super excited to set it up and watch her reaction and this is her first pretend kitchen. Now that she is monkey seeing monkey doing everything she can have fun copying mommy and bake her own little treats! During her afternoon nap I opened the box and sorted out all of the parts. I was happy to discover that there were very few small parts and not many steps to put it together. After snapping the pieces together and drilling in a few screws the Little Tikes Cupcake Kitchen was ready for action! It took me under 15 minutes which was a pleasant surprise as I had anticipated a more complicated setup. After it was all together I sat and waited in anticipation for Baby Digger to wake up so we could see her reaction to her new kitchen! When she finally woke from her nap she looked at it in bewilderment, smiled and walked over and began to play. She squealed when she discovered the oven door would open where inside I placed the cupcake tray for her to find. She loves to open the drawer and oven and carrying around the sprinkle containers and cupcakes. Baby Digger plays with it daily and each night I’m gathering the cupcakes, sprinkles and plates from about our family room. The Cupcake Kitchen also comes with play forks, spoons and knives but I’ve packed those away until she is a bit older and more stable on her feet. We ask her to bake us a cupcake and she will carry over a cupcake on a plate to us, though sometimes just the plate ends up making its way over to us :). It’s just amazing watching her pretend play and her imagination develop! Needless to say the Little Tikes Cupcake is a hit with her! With all the toys in our home I’m very glad it isn’t bulky and it fits nicely against a wall when it’s not in use. It has lots of adorable details from little cupcakes in the oven, a knob on the oven the clicks when turned to a sink and burner. There are lots of fun cupcake baking accessories included like sprinkles, a pot, dishes, forks, spoons, a cupcake pan and of course the cupcakes which are actually pretty real looking for plastic cupcakes! I love Little Tikes toys and the Cupcake Kitchen is no exception, it is a great little kitchen for little bakers! 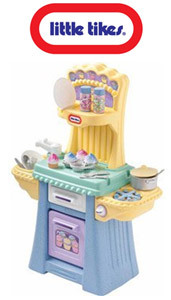 The Little Tikes Cupcake Kitchen can be purchased at Amazon.com for $39.99 + Free Shipping! Mommy Digger will be giving away a Little Tikes Cupcake Kitchen during the Win Your Gifts event which kicks off on November 3rd! You can get a head start on your entries like Little Tikes on Facebook and follow Little Tikes on Twitter. What a cute little kitchen, how fun! Love this! Liked them on fb! Would love to win that for my granddaughters! It’s adorable and I love the high quality of Little Tikes products! Adorable – my niece would love this! I would love to get my kids a inflatable bouncer to shed some energy! Our one-year-old loves to walk and crawl under things like our desk. I would love to get the pink playhouse for my daughter.